This story has been updated based on new developments -- please scroll down for the latest. For fans of Friends, you can basically call today "The One Where Everybody Finds Out" -- it’s been revealed that come January 1, 2019, the hit NBC sitcom will no longer be available on Netflix. According to Decider, Netflix recently snuck the impending departure date onto the show's details landing page. So, with the arrival of the New Year, expect to say goodbye to all 236 episodes of the series' 10 seasons -- news so upsetting that some fans reacted with the same unhinged rage as one of Ross' infamous outbursts. Can’t sleep so was trying to enjoy some Friends.. then Netflix gives me the notification that friends is LEAVING NETFLIX ON JANUARY 1st. My day is ruined at only 7:30 am.. and also my 2019. FRIENDS IS LEAVING NETFLIX ON JANUARY 1ST. In other news, I will be canceling my Netflix subscription on January 1st. The news of Friends leaving the streaming giant arrives just several months after Warner Media announced plans of launching its own streaming service as a result of the AT&T/Time Warner merger. 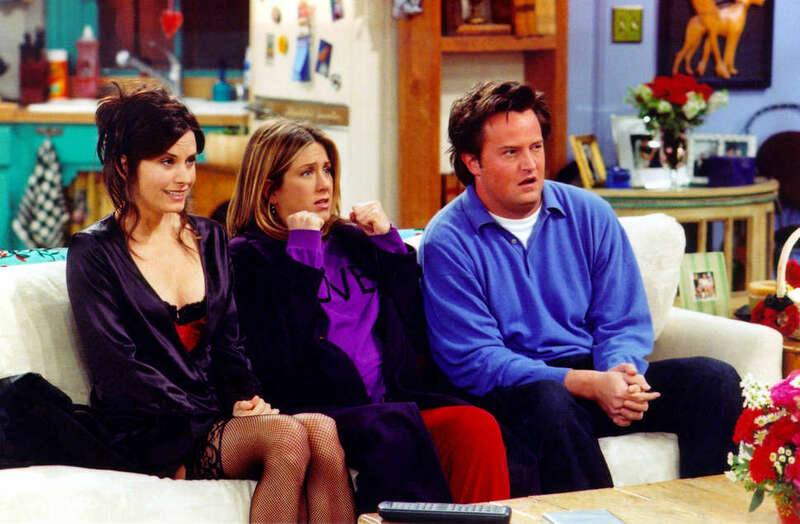 As the show is a Warner Bros. TV property, Decider notes that although you may not be able to watch your favorite misadventures of Monica, Chandler, Rachel, Ross, Joey, and Phoebe on Netflix, you will be able to see your favorite episodes on whatever service Warner Media launches -- as of now, it's set to be one of the first series to hit on the platform when it launches sometime in late 2019. While Friends’ departure is painful news for fans of the show, it ultimately offers a bit of insight as to what's likely in store for Netflix in the future. Earlier this year, it was rumored that The Office was set to leave the site, which Netflix took to Twitter to confirm wasn’t happening… at least yet. But as other media groups form their own streaming service with new and old exclusive content -- like what Disney’s been planning for quite some time -- content licensed to Netflix will slowly disappear. For now, you have just under a month to attempt to binge the entire series again, or at least get in one last viewing of favorites like "The One Where No One's Ready" or "The One With the Cop" featuring the seminal "pivot" scene. Instead of Netflix saying, "We were on a break," to Friends, they finalized their breakup with the series -- and until it arrives on the new Warner Media platform, you (unfortunately) will have to, too. Update 12/3 4:54pm: To make things more complicated, Netflix chief content officer Ted Sarandos told The Hollywood Reporter that the show's January 1, 2019 departure is just a rumor, although licensing negations are still in flux. Update 12/3 6:07pm: Netflix confirmed to THR that Friends will remain available through 2019, though is expected to move off the platform and onto Warner Media’s upcoming service in 2020. Update 12/4 11:25am: Early Tuesday morning, THR reported that AT&T chairman and CEO Randall Stephenson said that Netflix may have extended their licensing deal with Friends, but "they resigned it on a non-exclusive basis." This means the show can be on both Netflix and the streaming service that Warner Media is planning, though does not have to be limited to just their platform. Update 12/5 5:56pm: THR reported later on Tuesday that Warner Media and Netflix have officially reached a multi-year deal allowing Friends to be available on Netflix in 2019 and potentially both streaming networks in 2020 and beyond. For 2019 alone, the deal is estimated to be worth somewhere between $70-$80 million. Sadie Bell is the entertainment editorial assistant at Thrillist. She needs to rewatch one of her favorite 'Friends' episodes, "The One With Unagi" ASAP.